Now I’m really excited! I’m getting a TESLA! A) Get the Quadro 4000 card. 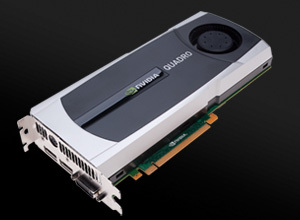 B) Get the Quadro 2000 card and add in a Tesla C2075 card. I asked some friends who know of these things (Thanks Jonah and Rik) and they both responded that I should go with the second option. I thought that was what they would say, so I quickly responded that, yes please, I”ll take Option B. The NVIDIA Tesla 2075 is essentially a separate card (GPU) to specifically handle graphic computation. NVIDIA® Tesla™ 20-series GPU computing processors turn standard PCs and workstations into personal supercomputers. Based on the NVIDIA CUDA™ GPU architecture codenamed “Fermi”, Tesla 20-series GPUs feature more than 500 gigaflops of double precision performance, 1 teraflop of single precision performance, ECC memory error protection, and L1 and L2 caches. Tesla 20-series GPGPU processors for workstations deliver cluster level performance right at your desk. 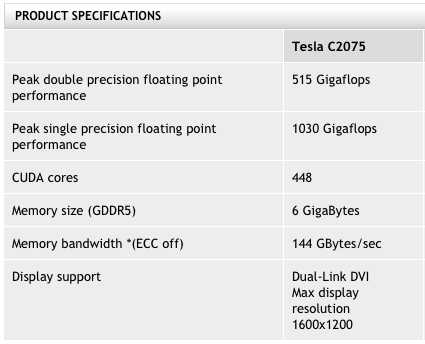 Tesla companion processors bring the power of high performance computing to the workstation. With 448 application-acceleration cores per board, Tesla processors offload parallel computations from the CPU to dramatically accelerate the floating point calculation performance. By adding a Tesla processor, engineers, designers, and content creation professionals accelerate some of the most complex tools exponentially faster than by adding a second CPU. It’s an unbeatable solution for getting more done in less time. Take advantage of the newest analysis, simulation, and rendering tools within industry-leading applications and see results in as little as half the time. Tesla C2075 companion processors deliver parallel processing power right at the desk, capable of streamlining the way users work every day. This means you can now explore, discover and deliver higher-quality projects faster than you ever thought possible. Looks like this will be a really great system! I can’t wait to fire it up. 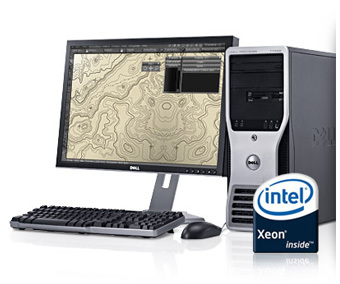 …And the winner is: Dell Precision T5500 Tower! I have decided to go with the tower configuration, despite the lure of portability the mobile option offered. With a tower I can add stuff on if needed and also have double the RAM (24 GB vs 16). Plus if they acquiesce to my request, I’ll have a sweet NVIDIA Quadro 4000 card with all those lovely CUDA cores. I responded back to the Product Manager by the requested deadline and now await the final answer on the configuration. I wonder if they will be closed on Monday for President’s day? My Dell-emma: Laptop or Tower? 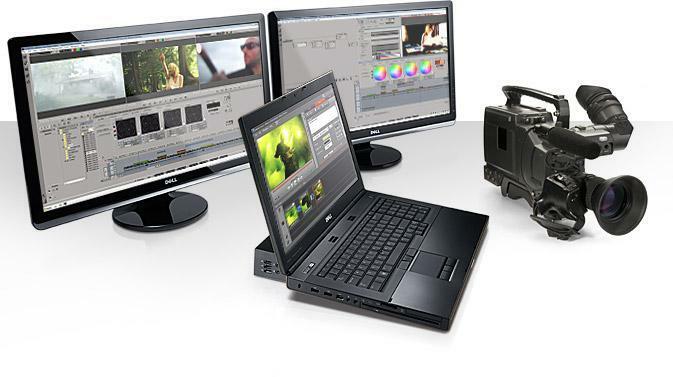 I have received a proposal for the Dell Precision system I am getting from Dell as part of their program for Final Cut Pro editors who are considering switching to Adobe Premiere using a Dell/NVIDIA platform. I had assumed that I would be offered a T5500 ot T7500 Precision Tower based system, but the preliminary system options also included a mobile option: either a Precision M4600 or Precision M6600. I will immediately disqualify the M4600 because it has a 15.6″ screen, and having owned a 15″ Titanium G4 PowerBook, even with a second monitor, that screen size is just too small to edit on. My current system at RED has a 24″ Samsung and a 27″ Viewsonic and I really like having all that screen real estate. The 17.3″ Dell Precision M6600 is intriguing as an option for its portability and hooked to a second monitor, it could work. It also comes with the NVIDIA Quadro 5010M which has 4GB GDDR5 and is a formidable card with 384 CUDA cores (thanks for the info Jonah). 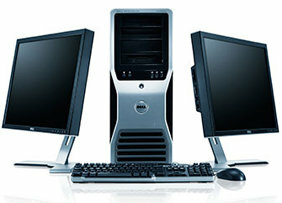 I AM getting a Dell! I’ve been chosen to be part of a program sponsored by Dell, NVIDIA and Adobe for Final Cut Pro editors who are considering switching to Adobe Premiere. 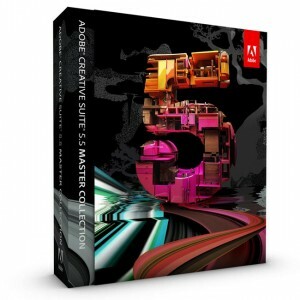 I will be receiving a Dell Precision system equipped with an NVIDIA graphics card and the latest version of the Adobe Creative Suite to evaluate the system as an alternative to Final Cut. I don’t know the exact configuration yet – I will post the specs when I get them, and I will be using this blog to chronicle my experience. Even though I am getting the system gratis (although I think I will be declaring it to Uncle Sam and have to pay tax on the value) I will be giving my honest evaluation of the pros and cons of this set up. I have used Premiere before and it really wasn’t the greatest- let’s say I would not have accepted a job that required me to edit on Premiere in the past. However, I have recently taken a look at the most recent version and it seems to be a much more adequate application. 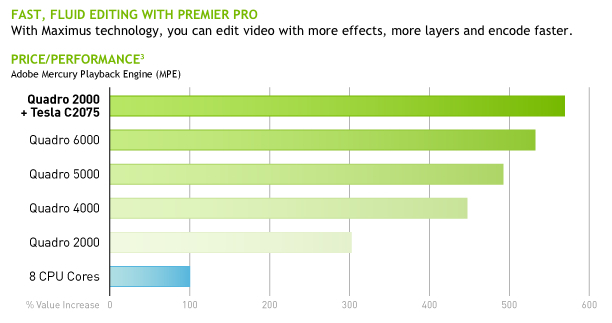 I am excited about seeing how the NVIDIA Quadro card with CUDA works with Premier and After Effects in terms of faster rendering and real-time playback. Some of the projects I do have many layers of graphics and I hope it will be faster than Final Cut Pro 7, which because it is 32 bit is limited in it’s use of RAM and isnt built to use the advanced GPU in an NVIDIA card.This program will also give me the opportunity to use a Windows PC as well, which I know some people will gasp at, me being such a staunch Mac user. Well it will be good for me to get more PC time so I’m looking forward to it. I’m (maybe) getting a Dell! On Tuesday I had a great conversation with Dell Computer about potentially being part of a program for FCP editors who are contemplating making the switch to Adobe Premiere. I am excited to be participating in the project, which entails being set up with a Dell Precision workstation equipped with an NVIDIA graphics card and Adobe software. I already use After Effects for making titles and graphics for the pieces I edit and it will be interesting to use Premiere to edit. I started editing on 3/4″ tape in 1984 and eventually got hired at First Edition, a film editing company in Manhattan. We edited TV commercials on film and were one of the first companies to have an in-house On-Line finishing facility. I was lucky to get to learn both film and tape editing at the same company. In 1988, had the privilege of beta testing the original Avid 1 Media Composer ( I was the only guy who had a Mac….) and I loved it. Even though it was buggy and the picture quality was horrible, it was amazing to be able to move scenes around and quickly reorganize a cut, something that would have been time consuming on film or tape. IWe recieved the unit on a Friday – it was a Mac II with the top open to the extra wires that connected to the video cards inside, and it had 2 R-MAG 600 MB drives for storage, each costing about $2500! I had a training course over the weekend with Mike Milligan from Avid who did a great job of explaining how Avid worked. That Monday I arrived at work, and my boss Bobby Smalheiser, informed me he wanted me to actually cut something with one of our clients. It was a spot for Lusianne Ice Tea, and it was all testimonial bites. I was a bit nervous as I was still really just an assistant editor but I figured what the heck. Then I got REALLY nervous when he told me I would be working with the head of the agency! The Avid turned out to be a great tool (when it wasn’t crashing-it was still version .03b software) I could quickly reorder the testimonial bites and the client was pleased. IT actually took a while to convince people to use Avid back then-it was so ahead of it’s time, but it seemed at one point around 1990 everyone started requesting non-linear, and pretty quickly it became the norm in editing. I hope to hear today about whether I have been chosen for the program and if so I will post about my experiences here.